During the evening of April 22, 2018 at approximately 5:55 pm, the AEF’s Smoky Mountain Nest Cam Volunteer Remote Camera Operator and Liaison identified what appeared to be some type of string in the nest. 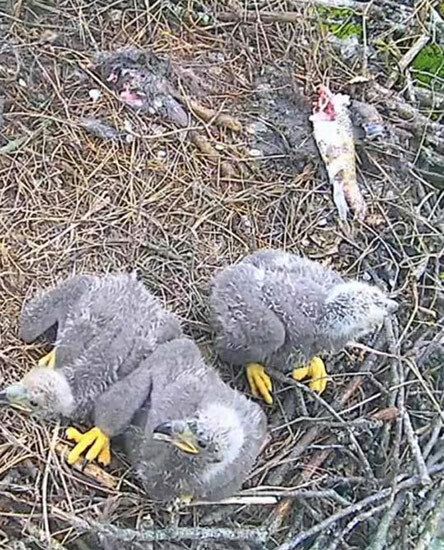 Upon closer observation by AEF staff and Smoky Mountain Nest Cam Volunteers, we concluded that a fish was brought to the nest by one of the parent eagles. The fish had spinner bait with a hook and braided line attached to it. The AEF Staff and Volunteers closely monitored the location of the fishing tackle and line within the nest. On April 23, 2018 at approximately 6:00 pm another fish with a hook and line attached was brought into the nest by one of the eagles. At that point, the AEF’s Al Cecere and Staff quickly began planning to remove the fishing line and tackle from the nest, first by obtaining approval from the USFWS and also enlisting the help of a professional arborist tree climber to assist in the process. On the morning of April 24, 2018 Al Cecere, Connor O’Brien and the tree climbing team went to the nest to remove the fishing line and tackle, upon further observation, it became obvious that one of the eaglets (SM15) had mono-filament hanging from its beak, so the eaglet was removed from the nest and taken to a local vet office for x-rays. 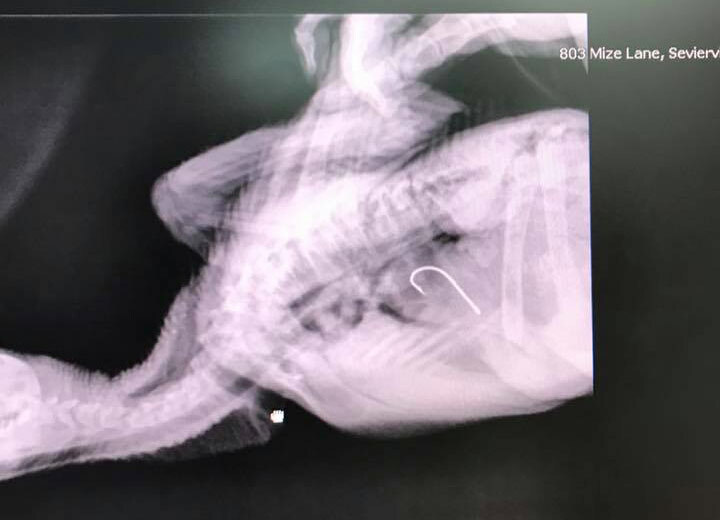 Those x-rays revealed that the eaglet (SM15) had swallowed a hook and was lodged inside the eaglet’s stomach. 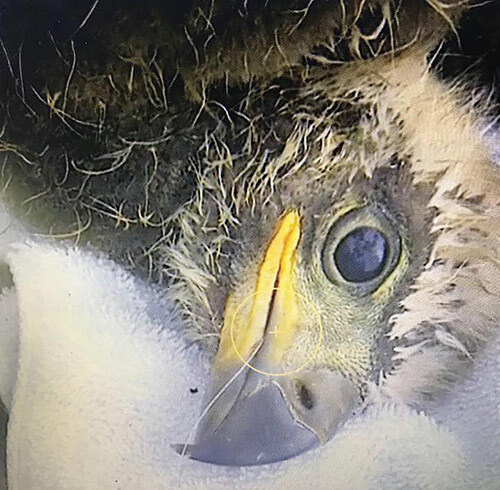 The eaglet was taken to the U.T. 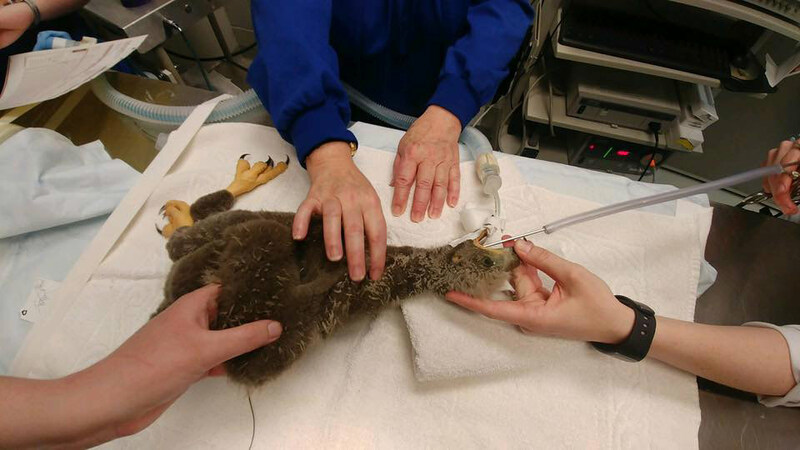 School of Veterinary Medicine in Knoxville, and they were able to successfully remove the hook from the eaglet’s stomach by anesthetizing the bird, then inserting an endoscope (a flexible device about the diameter of a ballpoint pen with a camera attached) into the eaglet’s mouth. 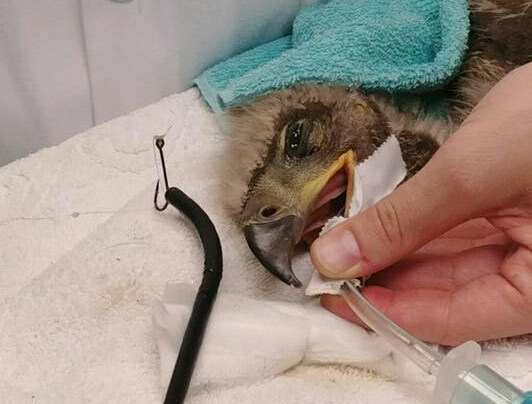 The vets observed as the device descended into the eaglet’s stomach until the hook was found. A tiny pair of forceps was threaded through the endoscopic tube and the hook was thereby extracted with no harm to the bird. 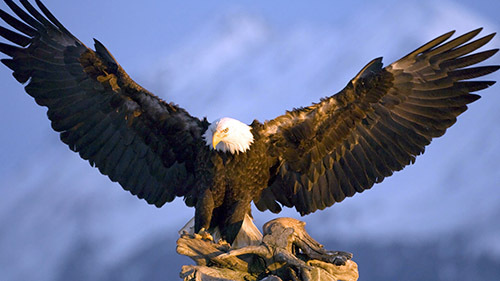 The following day, April 25, the eaglet was returned to the nest, and after a little bit of time, the adult eagles returned with food, and normal activities in the nest resumed. 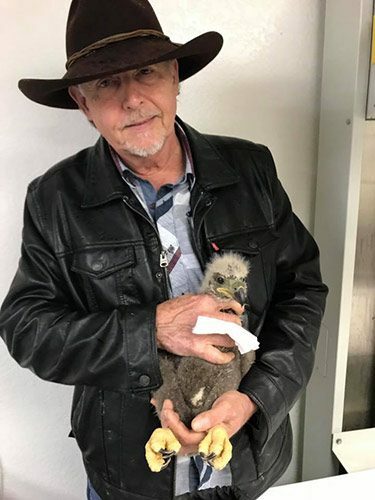 We thank everyone who made this rescue successful, giving this little eaglet a second chance to grow up strong and free. The eaglet had swallowed a fishing line. Extracting the hook using a non-surgical procedure. The hook was safely removed. SM15 was returned to the nest early the next morning following the successful removal of the hook from its stomach.